Motivated Developers Meeting the Market! The developer is heavily committed to other projects and requires immediate sale! This executive development of contemporary town houses bridges the gap between entry level apartments and high end million dollar homes. Fully re-clad using Integra Panel with cavity system, providing piece of mind. The city fringe position delivers the best of both worlds being zoned for both Christchurch Girls’ and Boys’ High. The dress circle location ensures you are close to all that the emerging city has to offer. The stylish décor is light, modern and relaxed and the specifications are second to none. The options are very versatile and there is something to suit everyone. You will have to be quick as no two are the same and you don’t want to be disappointed. Unit 1 is very secure with electronic gates, separate entry and key pad for pedestrian access. There is an internal access garage and an additional off street car park. The courtyard is sunny and there is a raised vege garden ready for you to stamp your own mark. On the lower level there is a separate entrance which leads to a kitchenette (with a large storage cupboard) and a shower and toilet. There is an area for an office or 3rd bedroom which is separated from the entrance with a dividing door and has access to the courtyard. Level two enjoys a spacious open plan living and stunning kitchen, perfect for entertaining. The third level has 2 double bedrooms, the ample sized master has a space suitable for desk or dressing table. There is also a luxurious bathroom with tiled shower, vanity and toilet. This special home has a loft feel with interesting angles and natural light. 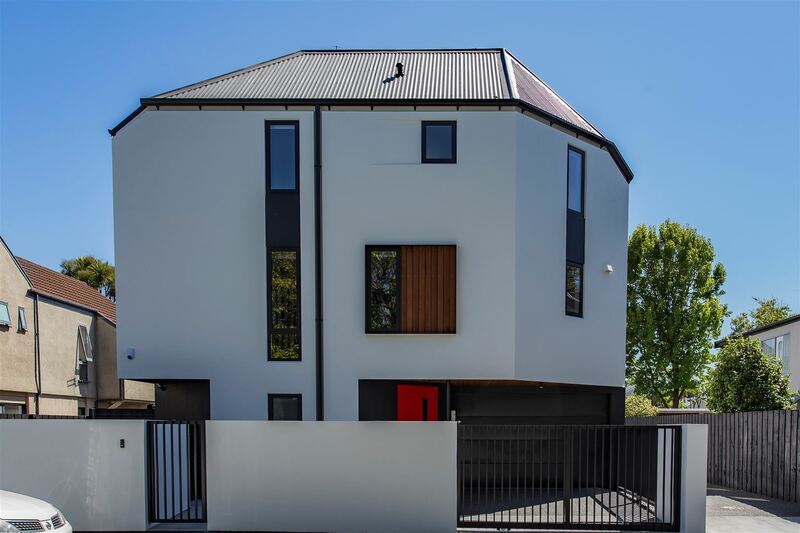 All of the townhouses have designer black feature fin balustrades. All are alarmed and have Bosch appliances, F & P fridges, under-tile heating in bathrooms, gas hot water, outdoor power and a contained area for bins and gas bottles. First in best dressed, delay will lead to disappointment. Phone Simon today for an appointment to view.